After seven months of challenging themselves in the classroom and competing against both their classmates and students from other schools across the Dallas-Fort Worth Metroplex, 46 students, teachers, and administrators from the Texas Motor Speedway Speeding to Readprogram were honored Sunday during pre-race festivities for the Monster Energy NASCAR Cup Series O’Reilly Auto Parts 500. A pair of teachers in the K-2nd Grade and 3rd-5th Grade categories also earned World Champion honors. Students who were declared champions of their school, and teachers and schools who earned Conference and Division championships joined the World Champions on the pre-race stage along the frontstretch of Texas Motor Speedway, taking part in a photo opportunity while the NASCAR crowd cheered on. This year’s Speeding to Read program featured 14 elementary schools and more than 7,500 students across grades K-5. Those students combined to read 242,877 books since the beginning of September. Dolores Huerta (Fort Worth ISD); Homestead (Lewisville ISD); Jay R. Thompson (Mesquite ISD); Price (Mesquite ISD); Ruby Shaw (Mesquite ISD); S.M. 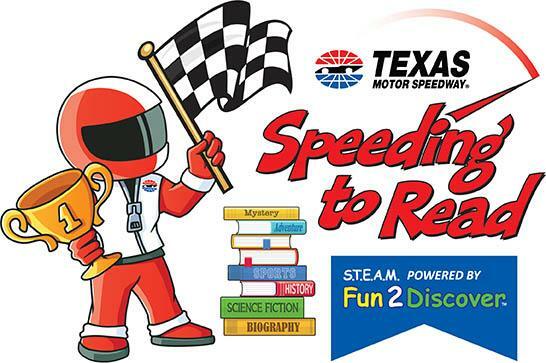 Seabourn (Mesquite ISD); Sidney H. Poynter (Crowley ISD); Stewart’s Creek (Lewisville ISD); and Tom C. Gooch (Dallas ISD).The Texas Motor Speedway Speeding to Read program started in 2011 with a single school. In eight years, 78 schools and more than 43,000 students have combined to read an astounding 5.5 million books. .Texas Motor Speedway’s Speeding to Read program is supported by the following partners: NASCAR, NTT IndyCar Series, Lionel Racing, Speedway World, Levy Restaurants, The Speedway Club, Food for the Soul, aai Trophies and Awards of Plano, Jostens, Woolley’s Frozen Custard, Reunion Tower, Speedway Children’s Charities-Texas Chapter, and Team Texas High Performance Driving School.